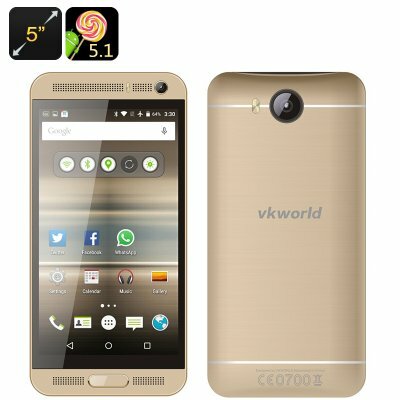 Successfully Added VKworld VK800X Android Smartphone - Quad Core CPU, Android 5.1, 5 Inch Display, Dual SIM, Smart Wake, 2200mAh (Gold) to your Shopping Cart. The VKworld VK800X is one of the best looking entry level phones around. Made from a ergonomic nanometer aero material and with a brushed finish curved rear its elegant looks and design are unparalleled in the budget phone market. This light-weight durable phone is perfect for one handed use thanks to a comfy 5 inch format and curved case. Taking advantage of smart wake features allows you to access all the top functions by simply drawing a character on the locked screen, it really couldn’t be easier. Alongside the Android 5.1 OS you get a secure intuitive user interface that responds to your every touch and brings improved performance to this budget cell phone. Under the elegant looks the phone has a capable quad core MTK CPU and 1GB of RAM that's sufficient to handle most games and all your daily phone needs. So watching movies, multitasking or conquering candy crush is not going to be a problem. Many entryl level phone have disappointing cameras but that's not the case with the VK800X. Its front and rear cameras both benefit from LED lighting so you can snap images in low light without worry and save precious moments any time of day. Now your selfies and party snaps will show rich colors and bring you nothing but likes when shared on your media page. The VKworld VK800X Smartphone comes with a 12 months warranty, brought to you by the leader in electronic devices as well as wholesale Android smart phones..